The sequel to 2007’s messiah compleX continues here! Cyclops has complete faith in his son, Cable, will do everything he can to protect the so-called mutant messiah-who he believes will save mutant kind. But he also knows what havoc former X-Man Lucas Bishop has wrecked in the nightmarish future. So now he’s sent his black ops team, X-Force, on a risky, time traveling mission to save cable and the child, completely unaware that there’s something waiting in the future. 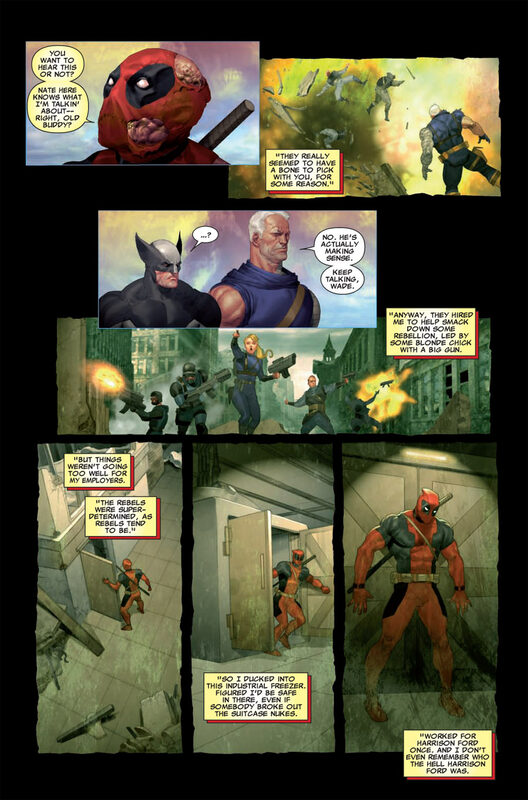 Something not even Bishop was counting on…..
Cable and X-force have been brought to a celestial city by Deadpool. He explains how he arrived in this time line and sided with Stryfe but now that they are here he sides with them. Elsewhere Stryfe and Bishop hunt for Cable. While Deadpool is explaining things Stryfe’s army arrives! Dangerous bedfellows– Bishop has a plan to deal with his “ally” once he gets what he wants but it’s far too simplistic to actually be accomplished. How often do plans ever go as planned in the X-books? 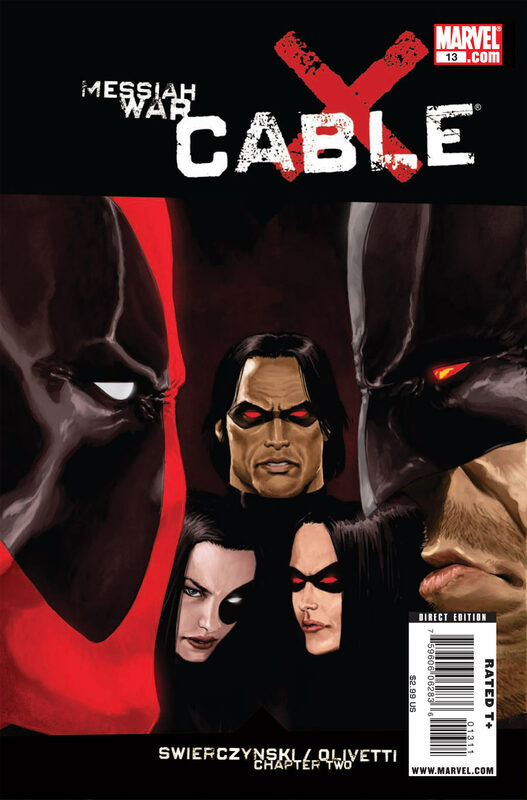 Cover– Dark and Ominous with the colors red and black being very dominant; Deadpool and Wolverine face off in the foreground while Warpath, Domino and X-23 watch in the background. Very eye catching! Art-Ariel Olivetti ‘s art was fitting for this apocalyptic tale. Family- This is a theme that runs through every vein of this book. Stryfe and Apocalypse has always been a favorite of mine from the 90’s. The dynamic is a highly dysfunctional abusive single parent Patriarch household with bouts of melodrama included. There is also the brother dynamic between Cable and Stryfe has also been central to their relationship. Sibling rivalry at it’s very best will megalomania to boot! The single parent dynamic between Cable and Hope though is the central driving force for the story itself. I’m actually thing this storyline could be used teaching my social studies class. Humor-Deadpool, deadool, deadpool hilarious as always! His inclusion injects some well needed levity to the situation. Slow- This issue had a very slow pacing compared to Messiah War Part 1.